Here is my review of Oven Clean’s oven cleaning system as seen on their video on their website. 1. In the video the Oven Clean franchisee is cleaning a Creda Continental standard double oven. The final shot of the “finished” oven shows that the enamel parts of the oven, and door have been cleaned but the self cleaning sides haven’t been removed to clean them and they are brown and on the back black with burnt on carbon; also the fan at the back hasn’t been touched either. When I started my oven cleaning business this would have been the way that I would have cleaned this oven and I would have told the client that sorry we don’t clean the self cleaning sides or the fan at the back. But after a visit, a few years ago now, to a house where the oven had been recently been cleaned by the local (Bristol) Ovenu franchisee I noticed that the oven and its self cleaning sides were perfectly clean – though for some reason he had missed the glass on the inside of the door. This oven was a Creda just like in the video. Really to ensure that we were getting the same standards of our competitors, in this case Ovenu, I started taking the self cleaning panels off on Creda ovens and putting them in our dip tank in the van. They came out perfectly. I also started cleaning the fan and the area around the back of the fan. Really the worry I had that this would add more time onto the job was incorrect as it didn’t. I am happier now as our results now are pristine GLEAMING ovens rather than half a job oven cleaning. See my Range Master cooker cleaning post to see what a CLEAN self cleaning panels should look like! The only problem with taking the sides off the Creda is getting them back on, you have to do some jiggling to get the holes lined up. But the way to do it is to put the aluminum corner plate back on over the TOP of the side self cleaning panel as by doing this this way you can get the holes lined up – I’ll do a video on this in the New Year so you get the idea. I don’t as a rule take off the self cleaning panel off the ceiling of the oven as really they are VERY difficult to get back on. If the sides aren’t that dirty I just take off the back panel – which means undoing four screws- and the fan and dipping them both. I clean the sides with a micro fibre cloth and degreaser. 2. I noticed that he didn’t remove the door of the grill compartment whilst cleaning it. I’d say it is unadvisable to do this as if the oven is older the hinges may have wear on them and just some slight added pressure from leaning on them will cause them to “go” which means you’ll have to fork out for a replacement. 3. When he opens up the back of the van and goes to pull out the oven cleaning dip tank unit it is obvious that it hasn’t been designed very well (well to me with my Technology Design Degree) as there is no handle to put it out. And when he does pull it out it shows how precariously balanced the tray is as he has to move it back into position to get it lined back up. Also when he does the solution is obviously boiling. Does this mean that the gas is lit and has been burning merrily away in the back of the van? Well yes of course it does – though I have heard that franchises stay with the burner to ‘watch’ the hot water, which they have brought out of the house, whilst it heats up until it gets to the correct temperature). When the racks have been taken out it doesn’t show him throwing the solution away. Really he’s got to pick up the hot tray with the solution in and pour it into one of his buckets and then throw it away. I know the solution is washing up liquid (that’s why he needs to rub the grill pan rack to get it clean after taking it out of the soulition ) but really some safety googles, with all the hot soapy water splashing around, would have made me happier. Really all these things both individually and together really throw up some big heath and safety issues. For us with five employees at once in a period in the last twelve months we have had to address all our Health and Safety Procedures. Really all this carrying around of hot water from the house to the tank and then watching it heat up and then throwing it away must add tons of time onto an Oven Clean’s franchisees day! Really when I am in ‘oven cleaning mode’ and I am in a rush to get things done this system would just slow me down so I am glad we use the system we do. As we use a chasis fitted tank that has been pre heated, is insulated, and stays hot all day we don’t have live flames at jobs, we don’t carry gas bottles around, we don’t have to handle hot trays of water, we use proper safety equipment and procedures. We don’t waste time going backwards and forwards with water buckets, which means we can clean four ovens easily in a normal 0900 to 1700 working day. 4. The final finish of the oven looked smeared. Really to get this right you need a dry cloth such as microfibre cloth and you apply pressure and rub over the glass – a perfect result. I am surprised that they let the woman giving the testimonial be filmed in front of a smeared oven – but we all can make mistakes when putting videos together – watch out for my franchise opportunity video I’ll try and not make them! You might be interested in this really dirty AGA I cleaned a few weeks ago. I drove all the way down to Salcombe on the South coast of Devon to clean two 2 oven AGAs. The first one was this one which hadn't been cleaned since it was new – quite a few years ago (as it hasn't got springs on the lids so it is pre 1995 and as there is no ledge at the back on the top so it is post 1974). I think the lady had been running it too cold as the grease in the "tunnels" of the ovens was thick but quite soft not what you'd expect. Also, unusually, on the floor of the simmering oven there was a build up of grease. I normally find a build up of grease on Rayburn cookers and never on AGA cookers as it normally burns off with the heat. Anyway it was a job an a half and took me three and half hours to clean; so an hour and half longer than it would normally take me to clean a two oven AGA cooker. Looking back at the photos I'm thinking I missed a bit there and a bit there. But when you have been really going for it for this length of time you just want to finish up and leave. Anyway I think I persuaded the owner to book in for a clean next August when we are in the area cleaning an AGA in a holiday let that we have cleaned every August since 2004 (along with their double oven, hob and extractor). I've taken some video of me cleaning this AGA and I'll post that soon. The next AGA of the day was exactly the same as the first one in that it was the same colour and year but it was really a lot better in that it really wasn't that dirty. This one took me about an hour and half. So this balanced our my day. So really a great AGA cleaning Salcombe day was had by me, even though it was along drive. Really Alan would have done this job normally, as its in his range, but he was off on maternity leave at the time. The reason we clean in Salcombe is that when I started I advertised AGA cleaning in the Devon Times and picked up a lot of business in the area which we still have. Its a great area of the world but can be a bit nippy at this time of year! Here is simon with his oven cleaning franchise testimonial. It isn't that great in the way it looks as I filmed it too far away from him and the light wasn't brilliant. Though the sound is fine – you'll get the gist of it. Simon is OvenGleam Berkshire and things are going very well. It was a great time, just before Christmas, to start an oven cleaning business. We did a business launch a few weeks ago at a DIY Superstore in his area and things went very well. We at OvenGleam.com are offering you the opportunity to be in control of your future by starting your own oven cleaning business. We we will train you and you will be up and running straight away and ready to clean ovens as an OvenGleamers franchise business owner (our franchise arm). – You will be sent an email to your inbox – please confirm this link. 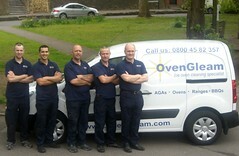 STEP THREE: Click HERE to Get the OvenGleamers oven cleaning franchise prospectus. STEP FOUR: Give me, Graham Rogers, or my wife Catherine, a ring in the office. We will then send you a detailed map showing an example of your terriorty in your area, and the current real returns and projected return our pilot franchise is getting in Berkshire. Have a look at what we are offering and then and make an appointment to come to our office meet us, see our system, see if it is right for YOU. Bring your wife, husband or partner along so they can check us out too. Ring us NOW on 01275 370571. Really now is the best time of year to start an oven cleaning business. We can train you and get you up to speed in our last franchisee training slot for this year which is going to be the last two weeks of November 2011 or at a push the last week of November and the first week of December 2011. So you can get trained during these two weeks and we can get all your marketing in place for the rush month of December and if things go well, as we think they will, you should be working well all the way through December. Because of this you should get an immediate return on your investment. So speak to us now if you are close to making a decision. Oven cleaner with premiership cup. This is a photo of me with the Barclays Premiership League cup.It was taken in the Summer at a Barclays business event at Bath racecouse. It was a fab day and I really learnt a lot and met lots of nice business people. As it has Chelsea's colours on I thought I need to put in on my blog as it may change this season after all! With Ray Wilkins leaving Chelsea's boat seems to have lost it rudder. Here is a photo of our oven cleaning vans which includes our franchisee's van. Alan's van wasn't in the line up as he'd been to far away, cleaning ovens in Devon, to make our weekly meeting that week. It isn't a good photo as it was getting dark and as the battery was flat on my camera we had to use our phone cameras to take some pictures. So from left to right, our newish Citroen Berlingo, Daihatsu Extol, Daihatsu Extol, Ford Transit Connect, Citroen Dispatch.The van missing is the older Citroen Berlingo. Here is a photo of our office in Bristol. We have recently had the sign writing done and it all looks very smart. We are pretty busy booking in ovens to be cleaned at the moment. Today seemed very much like last Monday in that I cleaned a large cream AGA though last week it was a two oven AGA with a module and this week it was a four oven AGA. For the one with the module,the module was very dirty so it meant a strip down to get the self cleaning bits out so that could be dipped. This week the third and fourth ovens were fairly clean as it was a repeat clean and they get it cleaned regulary.